I have written quite a bit about the California Environmental Quality Act, or CEQA, and when I was teaching Environmental Law and Policy at the University of California at Santa Cruz, the casebook I used described CEQA as a "Stop And Think" statute. The purpose of the law, in other words, is to make decision makers "stop and think" before taking an action that might have an adverse impact on the environment. Direct regulatory control is not a feature of the law. 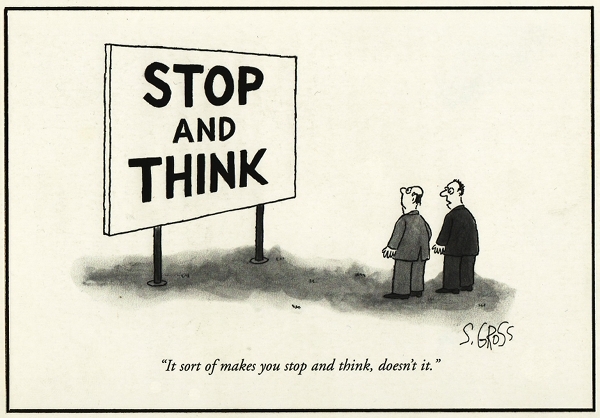 Lots of people don't understand this "stop and think" approach, and they think that the objective of CEQA must be more directly and typically "to protect the environment" by establishing regulatory standards to which proposed projects have to conform. That more typical and regulatory approach is emphatically not the way that CEQA is intended to work, and current attacks on CEQA, in the California State Legislature, are making use of this misunderstanding. CEQA opponents have couched their opposition to CEQA in terms of "reforming," or "modernizing," or "updating" the law (all of which sound quite reasonable), and they are criticizing CEQA because it leads to "delays" in the decision making process. Another ground of attack is that CEQA is no longer needed, since lots of laws to protect the environment have been passed since CEQA was first enacted. Because that is true, CEQA is now supposedly outdated and unnecessary. In fact, the basic way that CEQA works is by delaying decisions through a public review process, so that the public and decision makers can focus on both the "cons," as well as the "pros," of a proposed project. "Delay," in other words, is not a "flaw;" it is a basic feature! Furthermore, the "protection of the environment" that CEQA certainly hopes to achieve is to be achieved not by the kind of direct regulations found in the Clean Air Act, or the Clean Water Act, but as the outcome of this "stop and think" process. CEQA specifically mandates that after CEQA review is finished (the purpose of this review being to uncover problems that may have been overlooked), any feasible measures to eliminate or reduce identified environmental impacts must be implemented. "Standards based" laws, like the ones that CEQA opponents say are now able to take CEQA's place, don't do that at all. Quite the contrary, in fact. I started thinking about CEQA, and its "stop and think" approach to environmental protection, because I read something about Socrates in a recent posting in the blog published by the Hannah Arendt Center. Presuming that we think Socrates was a great philosopher (and even CEQA opponents would probably concede that), maybe we could learn something important by studying his techniques. According to Plato, Socrates' greatness was illustrated by three of this personal characteristics: First, Socrates acted as a "gadfly;" second, he acted as a "midwife;" third, he acted as a "stinging ray." I had heard of the "gadfly" and "midwife" comparisons before, but I had never heard (or didn't remember) the comparison of Socrates to a "stinging ray." In what way was Socrates (the great philosopher) like a "stinging ray?" According to the article linked above, it is the "paralysis" that occurs when a person encounters a stinging ray that led Plato to the analogy: "as stinging ray, Socrates ... makes you stop and think." Let's take some advice from a great philosopher. No need to "reform" that "stop and think" approach. It is actually good for us.